Today I visited St Peter's church on Doncaster Road, Barnsley with my new project partner JA and her husband. The full title of the church is St Peter the Apostle and St John the Baptist and I was hoping the incumbent might be able to tell us if the name means it absorbed the parish of St John's church which used to stand on Joseph Street in the Barebones area. St John's was demolished in the late 1960s. I wrote about St John's and St George's, another demolished church, a week or so ago. I had found evidence in the digitised Barnsley Chronicle at Barnsley Archives that both churches were planning commemorations for the men lost in the First World War who had belonged to the parishes and I am trying to find out if anything has survived the destruction of the buildings. My interest is in finding out how the various memorials in the Barnsley area were planned and executed. I started writing on this theme in September this year. 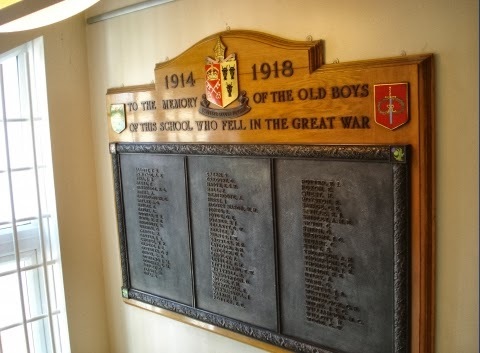 We were both quite shocked to find that there is no centralised Roll of Honour for Barnsley, at least not one that anyone now knows the whereabouts of. We plan to submit the locations of the memorials we find and the lists of names to the Imperial War Museum for publication on their website - the UK National Inventory of War Memorials. All kinds of memorial can be submitted - from "crosses and statues to bus shelters and park benches". My photo, seen here, is a bit of a Photoshop job - I'm afraid my camera flash reflected from the polished wood at the centre of the image so I had to paste in a segment from my other pictures. It was a bit too dark in the church for photos without flash and most of my sectional images came out blurred. Never mind - this was good enough and I can make out all the names. 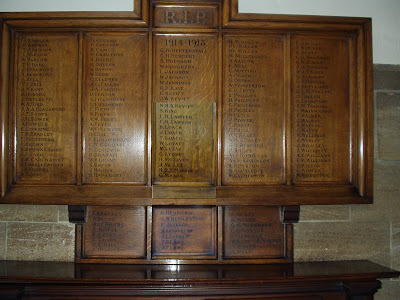 The darker, smaller board below the main board also bears names from the First World War. 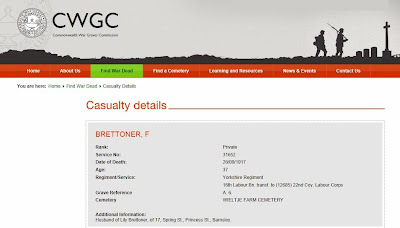 I hadn't been sure so after I had fiddled with the image to make it as readable as possible I called up the Commonwealth War Graves Commission website (CWGC) and started checking some of the more unusual names from both upper and lower sections. Although many of the entries didn't mention Barnsley the names on the lower sections are sufficiently unique to reassure me that it also relates to deaths in WW1. ﻿﻿Fred Brettoner appears on the plaque in St Peter's church - his name is towards the bottom of the first panel on the left. As you may be able to see on this image (click it to open in a larger window) from the CWGC website he actually lived with his wife Lily at 17 Spring Street, off Princess Street (near Morrisons) which is in the parish of St George's. 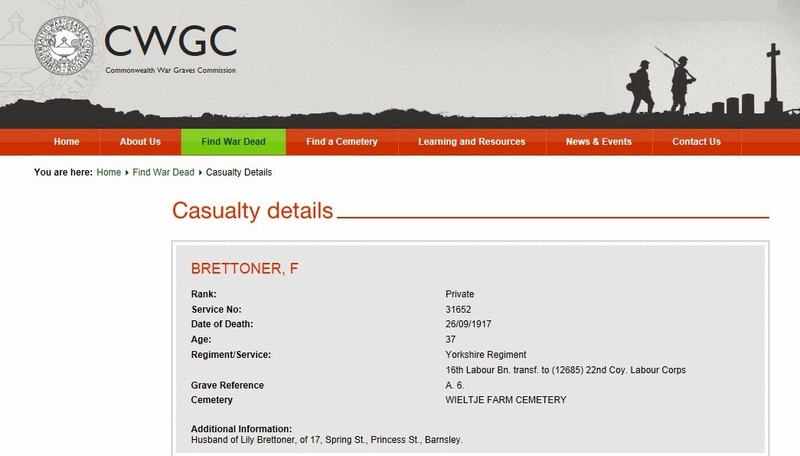 However his parents, John and Jane Brettoner, had lived on Doncaster Road, very near St Peter's church for many years so I imagine they had submitted his name for inclusion in the memorial in their local church. Father Paul was able to confirm that St Peter's had taken over the parish of St John's as I had suspected. He even knew of a parishioner who might be able to tell us if any items were transferred from one church to the other in the 1960s. He is going to keep in touch with us on this. And of course in a close knit community, as Barnsley was at the beginning of the twentieth century, just one hundred years ago, these men will have worked together, gone to school together and will have been married to each other's sisters; their families may have lived next door to each other, and even if they were incomers from Staffordshire or Durham to work in the new deep pits in Barnsley they may have come as members of communities or families from their places of origin. They will have known everyone in their area, and one hundred and sixty of them died over the four years of the war and no doubt many more afterwards from wounds, gas and the harsh environment in the trenches. One hundred and sixty names here, seventy four at St George's - that is from just two parishes in the town centre. There are so many more to research. Of course it is entirely possible that men will appear on more than one list like this in Barnsley. They could be listed in their home parish, in their parents' parish (as Fred Brettoner has been), at their place of work and their school. They might also be remembered at their local club. One of the newspaper cuttings I found last week mentioned displaying photographs of men in Smithies Chapel, Old Mill Chapel and Smithies Club. I wonder if those buildings still exist and whether there is a dusty pile of photos at the back of some cupboard? 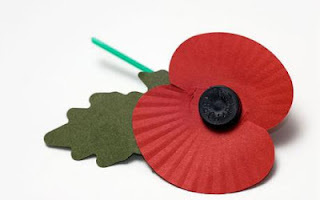 JA, GB and I with the assistance of Barnsley Archives, are compiling a list of War Memorial projects that have been undertaken or that are underway so we don't re-invent the wheel. If you know of any lists, plaques or other memorials in the Barnsley area please get in touch or if you have carried out research on the men named on a particular War Memorial please contact the Archives about depositing your work so that other people can benefit from your research. I enjoyed reading your blog, Linda. St. Peter's is a beautiful church.